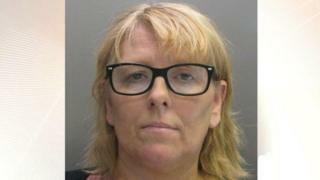 A prison worker who smuggled contraband for a convicted murderer she was having a relationship with has been jailed. Samantha Drinkwater, 49, met Michael Gregory while working as a teacher at HMP Whitemoor in Cambridgeshire. She was caught on camera passing several small packages to the prisoner, Peterborough Crown Court heard. Drinkwater admitted possession of cannabis with intent to supply and conveyance of an SD card into a prison and was jailed for two years. She also pleaded guilty to misconduct in a public office. The court heard how Gregory, who is serving a life sentence, was a Category A prisoner and described as a "dangerous individual". Evidence of the relationship between the pair was captured on camera in May last year, along with footage of Drinkwater passing several small packages to Gregory. Following her arrest, Drinkwater's vehicle was searched and a quantity of cannabis, a small Nokia mobile phone and four miniature bottles of whiskey were discovered. Examination of the phone revealed text conversations between her and another person that she later admitted was the prisoner. A search of her home on Hawthorn Road in Ramsey, Cambridgeshire, uncovered a notebook with doodles detailing their relationship and a number of electrical items including SD cards. When Gregory was searched, officers found an SD card which matched material on an external hard drive seized from Drinkwater's property and a small quantity of cannabis. Prisons minister Rory Stewart said the case was "shocking". "This kind of behaviour undermines a whole prison, it is dangerous. It threatens other, hard-working, dedicated staff and unfairly sullies their reputations too." Det Con Shelly Reeve added: "Drinkwater abused her position of trust and entered into this relationship in full knowledge that it was inappropriate."